Man City are currently eight points clear at the top of the Premier League. 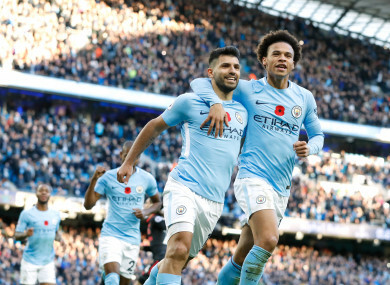 A BEHIND-THE-SCENES documentary on Manchester City’s 2017-18 campaign is to be screened by Amazon, the Premier League leaders announced on Thursday, with a reported fee of £10 million being paid to the club as a result. Pep Guardiola’s high-scoring City are strong favourites to win the Premier League title, having surged eight points clear at the top of the table, and have also reached the Champions League last 16. “We are delighted to begin this strategic relationship with Amazon, one of the world’s leading companies,” said City chief executive Ferran Soriano in a press release. American tech giant Amazon has already produced two series of a documentary programme called ‘All Or Nothing’, which follows the fortunes of NFL teams the Arizona Cardinals and Los Angeles Rams. Email “Amazon pay Man City reported £10 million fee for documentary series ”. Feedback on “Amazon pay Man City reported £10 million fee for documentary series ”.